This is a great and very tasty salad. It takes more time than a regular salads but its worth trying which you will know once you will eat it. This a wonderful salad which is even liked by the kids, so its a great way to make them eat spinach. 1. Take a medium bowl, whisk together the other ingredients like the sesame seeds, poppy seeds, sugar, olive oil, vinegar, paprika, Worcestershire sauce and onion. Cover, and chill for one hour. 2. 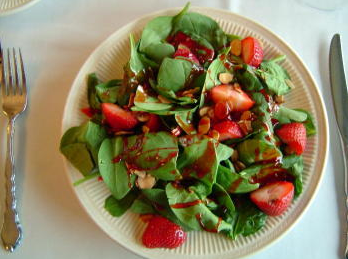 Now in a large bowl, combine spinach, strawberries and almonds. Pour dressing over salad, and toss. Refrigerate for around 10 to 15 minutes before serving. You can also substitue balsamic vinegar for white, purple onions instead of white then add blueberries and bananas to the strawberries.